Tu B’Shevat, known as the New Year for trees or Jewish Arbor Day, is celebrated by planting trees, enjoying nature and eating dried fruits and nuts, especially those of the seven species (wheat, barley, grapes, figs, pomegranate, dates and olives). 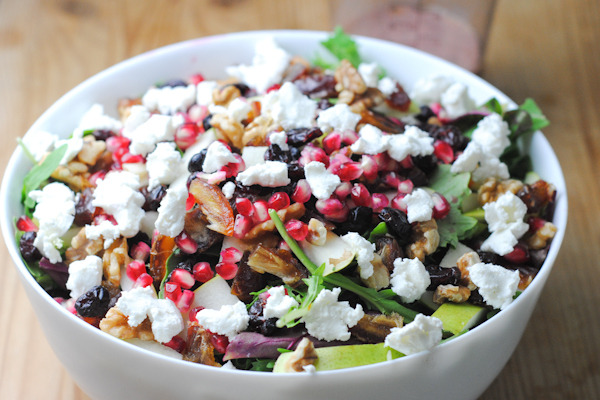 This flavorful salad with pomegranate vinaigrette fits the bill! Since Tu B’Shevat is all about the earth, it’s only natural that fruits and nuts be eaten to celebrate the holiday. There isn’t any one particular dish that’s served, so anything from appetizers to desserts that incorporate these elements is suitable. This is far from your average salad. Despite all the fresh and dried fruits, it’s not a fruit salad and is surprisingly savory with little bits of sweetness shining through. It’s excellent on its own but also makes an impressive side to go with any meal. Feel free to switch up any and all of the ingredients. Use your favorite nuts and dried fruits in place of the ones here, substitute pear for apple, feta for goat cheese or cranberry juice for pomegranate in the dressing. Put the olive oil, vinegar, pomegranate juice, honey, mustard, salt and pepper in a bowl. Whisk together until emulsified. Set aside. Put the lettuce, pear, pomegranate seeds, walnuts, dates, dried cherries or cranberries, and goat cheese, if using, in a salad bowl. Toss with the reserved pomegranate vinaigrette and serve.